Every good dental hygienist’s party trick is being able to tell if you’re left- or right-handed by looking in your mouth. We spend so much time and money on skincare, cosmetics and hairstyles, but so much less on our teeth and gums, which are an essential part of the way we look (not to mention the way we eat and the way our breath smells!). Your Hygienst can look in your mouth and tell you – correctly –If your right or left handed. 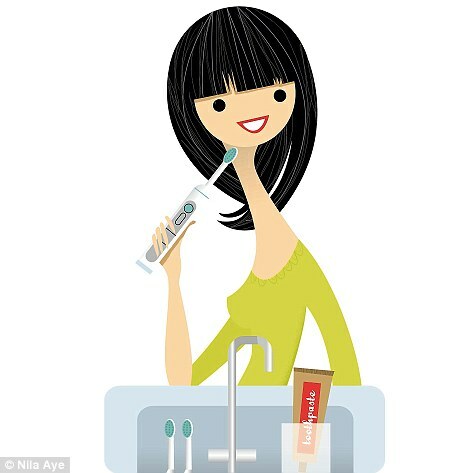 It’s not rocket science, as we automatically gravitate to the side that’s easiest to brush, so right-handers typically pay less attention to the right side of their mouth where, as a result, there are likely to be more plaque deposits and therefore puffier gums prone to bleeding. Many of us are damaging our gums by not clearing away the harmful bacteria in plaque that accumulate during the day. If left unchecked for 24 hours, these bacteria start to cause inflammation and bleeding gums (ie, gum disease) and the gum to come away from the tooth. If inflammation spreads into the bone, the tooth loses its foundation and eventually becomes loose. An overgrowth of bacteria in the mouth has also been linked to an increased risk of heart disease, diabetes and complications in pregnancy, as well as premature birth..
We recommend changing to a Philips Sonicare toothbrush (which comes with a UV cleaner to keep the head bacteria-free). You don’t have to actually brush with this – the Sonicare’s high-frequency bristle motion does that for you. Instead, hold the toothbrush steady where tooth meets gum for a count of six on the inside and outside of each tooth – about three minutes in all. One (or ideally two) three-minute brushings daily plus flossing clears the bacteria completely before they can cause inflammation. Ask Dr. Dean and our Hygienists about the Sonicare toothbrush and to get coupons here in our office!